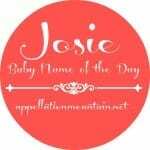 Looking for unexpected Josephine nicknames? Josephine doesn’t need a nickname, of course. But as the name becomes more popular, you might find yourself looking for ideas. It’s often shortened – almost automatically! – to Josie or Jo. Why those two nicknames? Josephine isn’t too far outside of the current US Top 100, and Josie hovers right around the #250 mark. 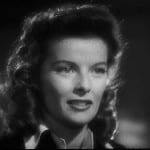 Jo has literary cred galore, thanks to Little Women’s gutsy Jo March. But there are plenty of other possible nicknames, including these eight, great, unexpected Josephine nicknames. Joey – If girls can be Alexandra called Alex and Charlotte called Charlie, there’s absolutely no reason that Josephine can’t be the equally boyish Joey. Need more proof? If you grew up with Dawson’s Creek, you’ll remember the show’s Joey – Josephine Lillian Potter, played by a young (and pre-Tom Cruise) Katie Holmes. 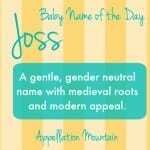 Joss – Take the Jos from Josephine, change the o-like-go to an o-like-moss, and you have one of those great unexpected Josephine nicknames. Director Joss Whedon was born Joseph, but unlike Joey, this one is well-established as a unisex nickname. Posy/Posey/Poesy – At first glance, poetic and pan-botanical Posy seems like a stretch from Josephine. But consider Pepe, the well-known diminutive for the Spanish masculine form of the name, José. In Italian, Josephine becomes Giuseppina. Take the Jos, swap the ‘J’ for a ‘P’ and there you have it. Sosie – I’ve loved the sound of Sosie ever since Kyra Sedgwick and Kevin Bacon gave the name to their daughter way back in 1992. But what does Sosie mean, and where did the name come from? It’s unclear, but I can imagine Sosie as short for any of the Susan names, or Sophia, too. But lately my favorite is seeing Sosie as one of the unexpected Josephine nicknames. Sephie – I always found Steffy an unsatisfying nickname for Stephanie, but it’s definitely seen plenty of use – enough to feel familiar. (Credit to tennis champ Steffi Graff for that, too.) So how about Sephie? Unlike Posy or Sosie, it takes no onomastic gymnastics to get to this logical short form. Fifi – Some of the most interesting Josephine nicknames come from the F sound in the name’s final syllable. If Fee can be short for Fiona, surely Fifi works for Josephine? And it’s a very French nickname, mais oui! Fina – If Fifi is French, Fina feels more Spanish. That’s because Josephine becomes Josefina in Spanish – but also in Swedish. Slavic languages often use Jozefina. There’s no reason Fina couldn’t work for Josephine, too. Finn – Love the idea of a boyish nickname in the key of Joey, but want something a little more modern? Appreciate slim, trim names for girls? In many ways, Finn is the modern answer to Jo. Finn might feel like a stretch from Josephine, but the sounds are all but there, and I think it works. What’s your favorite of the Josephine nicknames? Are there others I missed? I adore Fifi! 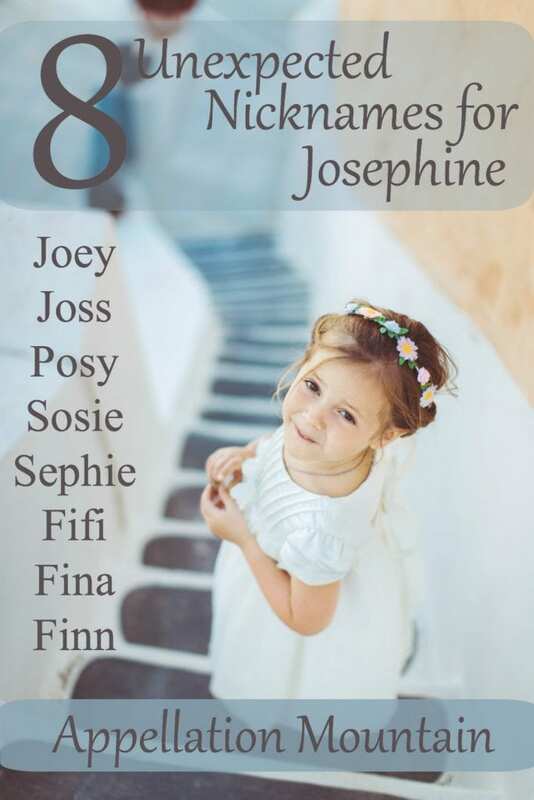 Josephine is a great and elegant name on its own but I like how many of its nicknames are so playful. Fifi is my favourite, but Sosie and Fina are lovely too, and Finn is an interesting idea. How about Jody, I heard that was a nickname for Josephine. I had a Tante Phine, but of course, everyone else just called her Phine. 🙂 It’s one of the first nicknames I think of for Joséphine, but maybe it’s just a French thing. I’ve seen Sosanna, which is allegedly an Irish form of Susannah, and I always wondered if that’s where Kevin and Kyra got Sosie (which I’ve loved ever since they named her, and Sosie Ruth is the sweetest combo!). I remember reading (maybe here!) about how the twins names in Fangirl were inspired by Rainbow Rowell’s great grandmother, who had surprise twins, and split the name she had picked out into Josie and Fina.